Charlotte Haley in the documentary Pink Ribbons, Inc.
We celebrate the life of Charlotte Haley, creator of the first “breast cancer ribbon,” who died February 2, 2014 at the age of 91 at her home in Simi Valley, CA. She is survived by her three children Leslie, Nancy and Robert, five grandchildren, two great-grandchildren, and her sister Iris. BCAction members may recognize Charlotte Haley’s story from the documentary film Pink Ribbons, Inc. in which she tells the often-overlooked tale of the first breast cancer awareness ribbon, which was not pink in color but peach. 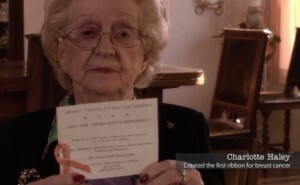 In 1991, Charlotte began hand-making peach breast cancer ribbons in her dining room. 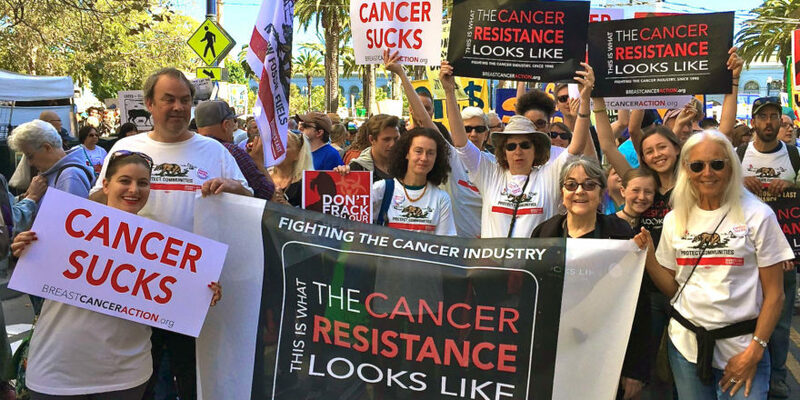 To each packet of five ribbons she attached a postcard that read: “The National Cancer Institute’s annual budget is $1.8 billion, only 5 percent goes for cancer prevention. Help us wake up legislators and America by wearing this ribbon.” Her ribbons were a call to action: a demand for prevention of this disease and greater accountability. Charlotte’s peach breast cancer ribbons were a call to action: a demand for prevention of this disease and greater accountability. Haley was strictly grassroots, handing the cards out at the local supermarket and writing to prominent women, everyone from former First Ladies to Dear Abby. Her message spread by word of mouth. By the time Self magazine called asking if they could use her ribbon in their second annual “Breast Cancer Awareness” issue, Haley had distributed thousands of her peach-colored ribbons for breast cancer prevention. A savvy marketing executive, Alexandra Penney, then the editor-in chief-of Self, and Evelyn Lauder, senior vice president of cosmetics company Estée Lauder saw the potential of a ribbon branded to breast cancer. But Charlotte told Self and Estée Lauder that she wouldn’t work with them – they were too corporate and commercial for her. Legal counsel quickly revealed that by changing the color from peach to pink, permission to use Haley’s idea wasn’t necessary. They chose a new color and the now iconic bubble gum pink we see adorning countless products every October was born. Though Charlotte Haley’s peach ribbon has been eclipsed by its cheerful pink cousin, her grassroots activism and commitment to breast cancer prevention continue to inspire members of our community. 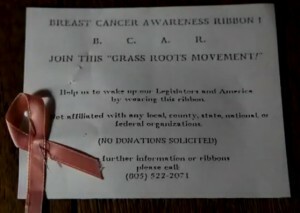 At BCAction, we have always made a point to write Haley back into the history of breast cancer activism. We mourn her death and we applaud her independent grassroots activism and honor her dedication to taking action as a way to address the breast cancer epidemic.